Several diseases have been effectively treated by bone-marrow and solid organ transplantation, and in such circumstances long-term immunosuppression is inevitable. The fallout of this practice is not only the development of opportunistic infections, but also malignant neoplasms in these patients. Epstein–Barr virus (EBV), a common human pathogen, is instrumental in the genesis of different types of lymphomas and undifferentiated carcinomas of the upper aerodigestive tract. This ability of tumorigenesis is heightened in transplant recipients, who tend to develop post-transplant lymphoproliferative disorders. In other immunocompromised states, such as acquired immunodeficiency syndrome, autoimmune disorders, or congenital immunodeficiency syndromes, the virus also promotes smooth muscle proliferation, designated as EBV-associated smooth muscle tumors. Similar lesions following transplantation, i.e., EBV-associated post-transplant smooth muscle tumors (PTSMT) are relatively uncommon. We report multifocal miliary-sized leiomyomas in the lungs in renal transplant recipient as an incidental finding. A 31-year-old kidney transplant recipient developed fatal pulmonary edema and hemorrhage during hemodialysis. He had undergone a living-donor renal transplantation in the year 2000 for chronic kidney disease; details of the primary disease were not available. He had been on immunosuppressive therapy (azoran, wysolone, and byoral) with serum creatinine ranging from 1.2 to 1.8 mg/dl. The patient had been diagnosed as a case of pancytopenia in 2009 with recurrent hospital admissions for fever, loose motions, and boils over the body. The current admission was for acute febrile illness of 7 days' duration with chills, headache, and boils over the buttocks. He was admitted to private healthcare center where hypotension (90/70 mm Hg), right gluteal region abscess, multiple sebaceous cysts over scrotum, and severe azotemia (serum creatinine of 6 mg/dl) with progressive oliguria was also noted. In view of these clinical features, he was transferred to our center for further management. 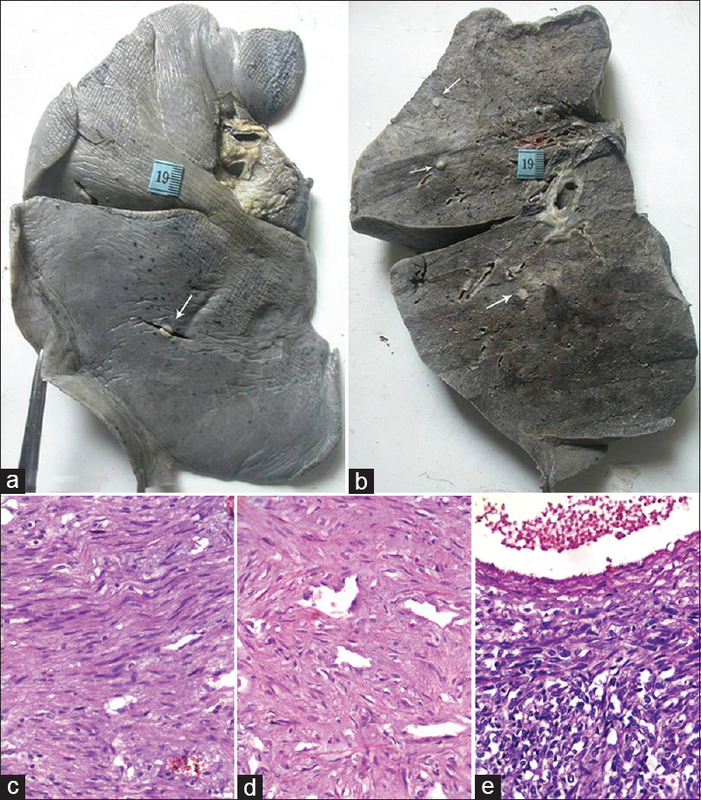 At autopsy, multiple small well -circumscribed firm glistening nodules [Figure 1]a and [Figure 1]b were seen scattered in the edematous and hemorrhagic pulmonary parenchyma; some could even be easily shelled out. On histology, these were present close to the bronchovascular bundle and were composed of interlacing bundles of spindle-shaped cells. These had the morphology of smooth muscle cells [Figure 1]c,[Figure 1]d,[Figure 1]e, which did not display pleomorphism or nuclear hyperchromasia. Occasional nodules showed significant hyalinization, while a nodule appeared to arise from the adventitial aspect of a muscular artery; it showed cellular pleomorphism devoid of mitoses. On immunohistochemistry (IHC), the cells were positive for desmin, smooth muscle actin [Figure 2]a, and also for EBV-encoded early RNA (EBER, [Figure 2]b. A diagnosis of EBV-associated smooth muscle proliferation was made. Depending upon the symptomatology, size, site, and high-grade nature (if present), the treatment modalities are reduction in immune-suppression, surgical resection, anti-viral therapy, or even chemotherapy. Our patient may not have required treatment since all lesions were miliary-sized and had a bland morphology. But such a manifestation of pulmonary PTSMTs should be borne in mind as a differential diagnosis of miliary or nodular shadows on imaging in transplant recipients. Dantey K, Pantanowitz L. Iatrogenic solid tumors following immunosuppressive therapy. Semin Diagn Pathol 2018;35:272-8. Purgina B, Rao UNM, Miettinen M, Pantanowitz L. AIDS-related EBV-associated smooth muscle tumors: A review of 64 published cases. Pathol Res Int 2011;2011:561548. doi: 10.4061/2011/561548. Hussein K, Rath B, Ludewig B, Kreipe H, Jonigk D. Clinico-pathological characteristics of different types of immunodeficiency-associated smooth muscle tumours. Eur J Cancer 2014;50:2417-24. Dekate J, Chetty R. Epstein-Barr virus-associated smooth muscle tumor. Arch Pathol Lab Med 2016;140:718-22. El Hennaury HM, Habhab W, Almutawa A, Shinawi S, Al Ayd A, Fahmy A. Long-term follow-up of post renal transplantation Epstein-Barr virus-associated smooth muscle tumors: Report of two cases and review of the literature. Tranpl Infect Dis 2018;20:e12841. Deyrup AT, Lee VK, Hill CE, Cheuk W, Toh HC, Kesavan S, et al. 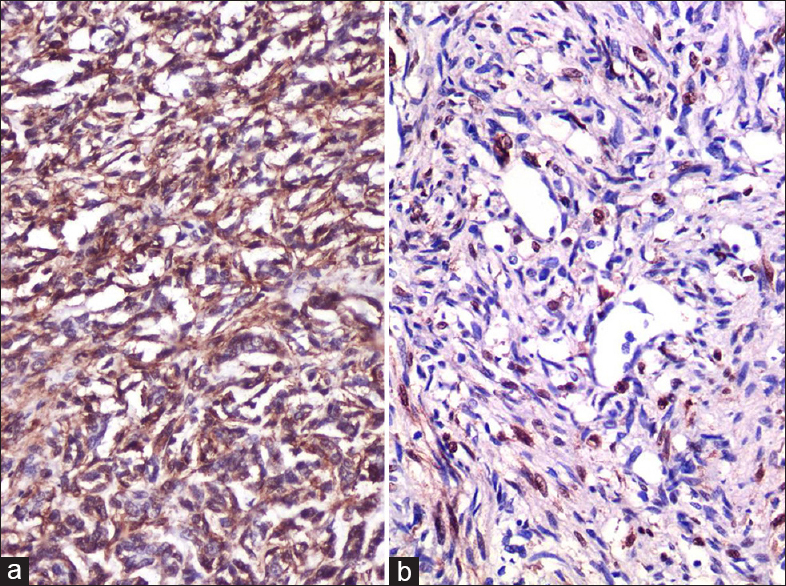 Epstein-Barr virus-associated smooth muscle tumors are distinctive mesenchymal tumors reflecting multiple infection events: A clinicopathologic and molecular analysis of 29 tumors from 19 patients. Am J Surg Pathol 2006; 30:75-82.